This calculator will not work with Internet Explorer. You appear to be running Internet Explorer or another incompatible browser; if so, all the results will be “.000”. 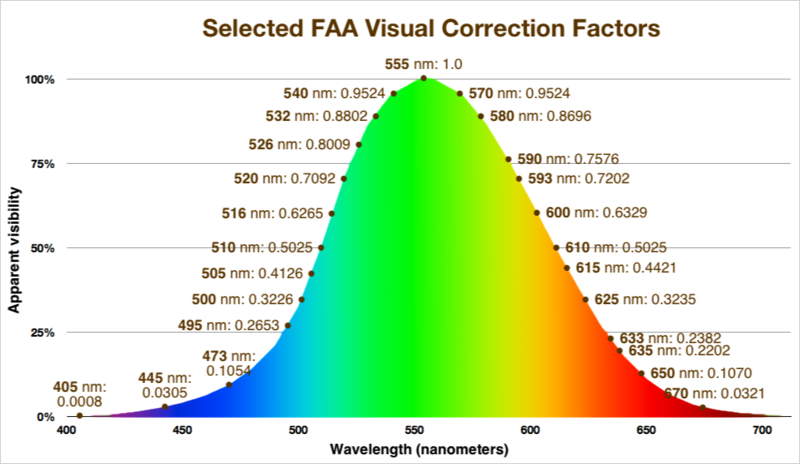 If you know the power, divergence and wavelength (precise color) of a visible, continuous wave laser, you can use the online calculator below to determine the eye hazard distances NOHD and ED50, and the Federal Aviation Administration visual interference hazard distances SZED, CZED and LFZED. For more information on what these hazard distances mean, and on the equations behind the calculations, see the Laser hazard distance equations page. For a quick, at-a-glance comparison of various laser powers and colors, see the Laser hazard distances chart. To calculate beam diameter and irradiance at a specified distance, use the Beam Diameter and Irradiance Calculator. This calculator is valid only for lasers emitting visible (400-700 nanometers), continuous wave (CW) laser light over long distances. It assumes an unwanted exposure where a person moves and/or blinks within 1/4 second to avoid the light; this is a standard assumption within the laser safety field. The milliwatt, milliradian and VCF inputs are color-coded to match the Laser hazard distance equations on which this calculator is based. Enter the laser’s power in milliwatts. If you know the power in watts, multiply the watts by 1000 to get milliwatts. For example, for a 1.5 watt laser, enter 1500; for a 40 watt laser enter 40000. If you don’t know the beam divergence, use 1 milliradian for lasers under 500 milliwatts in power, and 1.5 milliradians for lasers 500 milliwatts and above. Enter 1 unless you also want to calculate the non-injurious "visual interference" such as flashblindness and glare, which is based on the laser beam's color. (The human eye will perceive green light as being brighter and more interfering with vision, compared with an equivalent amount of blue or red light.) Below are the FAA Visual Correction Factors for selected laser wavelengths. For example, if your laser is the common 532 nm green, you would enter 0.8802 as the VCF. If you don’t know the laser’s wavelength, or if you want the safest, most conservative calculations, enter 1 as the VCF — this will give the longest hazard distances. Results are below, in black. The numbers are in the distance unit selected above, to the nearest tenth of a unit (one decimal place). Results are continuously updated as you enter new information — you do not have to click a “=‘ or “Calculate” button. The NOHD and ED50 distances below depend only on the power and divergence of the laser. At some distance from the laser, the light intensity will be at the Maximum Permissible Exposure (MPE). This distance is called the Nominal Ocular Hazard Distance (NOHD). NOTE: If all results are “.0”, then the calculator does not work with your browser, which is probably Internet Explorer. Please use a different, up-to-date browser. Starting at the NOHD distance, laser light directly entering the eye is at the Maximum Permissible Exposure (MPE) and is generally considered safe. Specifically, at the NOHD there is “a negligible probability of damage” according to the laser safety standard ANSI Z136.1. The farther one gets from the NOHD, the lower the irradiance, meaning that the light is even safer. Being exposed to laser light within the NOHD does NOT mean that a person will automatically receive an eye injury, or even is likely to have an injury. The NOHD is a “nominal” hazard distance, not an actual hazard distance. The closer a person is to the laser, the greater the chance of an injury, as shown by the colors in the diagram below. At the ED50 distance, there is roughly a 50-50 chance that a fixed laser beam aimed into an unmoving eye under laboratory conditions will cause the smallest medically detectable change to the retina. Such small changes can heal — just as small skin cuts and burns can heal with no adverse effect. The MPE light level (irradiance) was set by laser safety experts to be one-tenth of the ED50 irradiance. Said another way, the ED50 irradiance is 10 times the Maximum Permissible Exposure (MPE). This gives an added “safety margin” or “reduction factor” that is 10 times the where injury barely occurs. The ED50 irradiance is 10 times the MPE irradiance, while the ED50 distance is a little less than 1/3 the NOHD distance. This is due to the inverse square law of light. The ED50 distance is the square root of 10, or 0.316 times the NOHD. “ED” means “Effective Dose.” This term comes from pharmacology, where ED50 refers to the dose of a drug that produced an effect in 50% of the population that took the drug during testing. What is the MPE for this calculator? As stated at the top of this calculator, the results are valid only for visible light exposures of less than 1/4 second, from continuous wave (not pulsed) lasers. A person would be expected to see the visible laser light and to automatically blink and/or turn away in 1/4 second or less. This is called the aversion reflex. The NOHD for a 1/4 second exposure is calculated to be the distance where the beam irradiance just reaches 2.54 mW/cm2. Beyond this, the irradiance will be lower and beam is considered safe for direct eye exposure of 1/4 second. What are some other MPE values? This calculator uses the 1/4 second Maximum Permissible Exposure for visible laser light. There are other MPE values for other exposure times. For example, if a person deliberately overrides their aversion reflex and creates a longer exposure, the MPE would be lower. Since the NOHD distance is directly based on the MPE, if the MPE is lower than the NOHD will be a longer distance — the laser light will have to travel farther before it falls below the lower MPE value. Here are the MPE for some selected exposure times. These are the maximums; you are not allowed to exceed this value, for the exposure duration listed. 0.011 - 0.25 second: 2.54 mW/cm2. This value is used for accidental, unwanted exposure to visible light, where a person is expected to blink and/or turn away within 1/4 second of experiencing a bright light. For longer exposures such as 10 seconds, 10 minutes and 8 hours, the MPE is wavelength dependent. For example, the MPE for a 10 minute exposure to red 633 nm laser light is 0.253 mW/cm2; for blue-green 514 nm laser light it is 0.0167 mW/cm2. These values come from the laser safety standard ANSI Z136.1. Usually, the more powerful a laser, the larger the typical divergence of the laser. 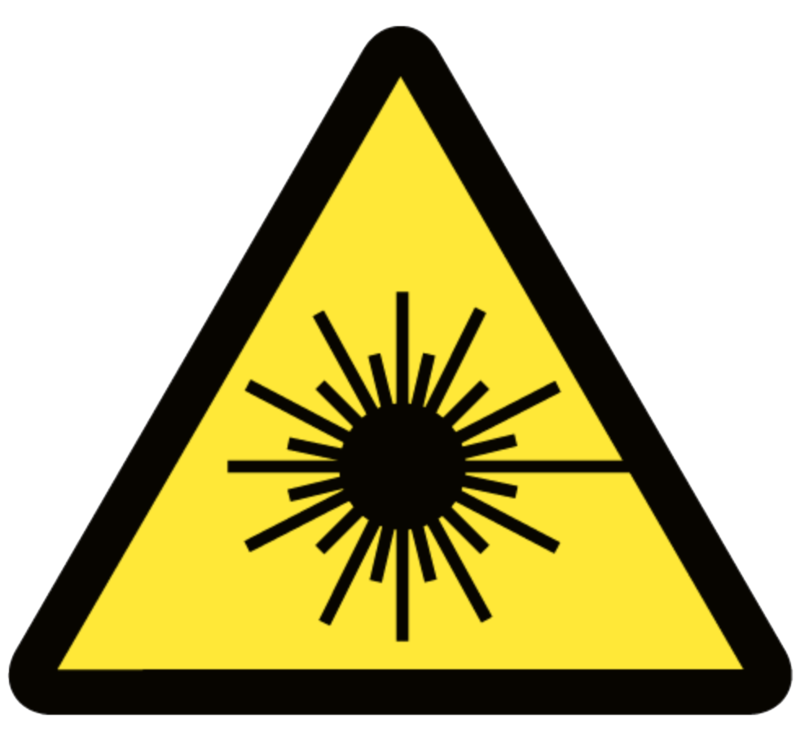 As consumers obtain more powerful lasers, the hazard distances (NOHD, visual interference) increase less than one might expect. A laser 100 times as powerful is not 100 times as dangerous; it is “only” 10 times as dangerous, assuming the divergence is the same. And since divergence usually increases with power, the beam may be even less hazardous due to the increased spreading. The visual interference distances depend not only on the laser’s power and divergence, but also on the Visual Correction Factor of the laser’s wavelength. That’s because the human eye is more sensitive to greens and yellows, and less sensitive to blues and reds. These three visual interference distances are used by the U.S. Federal Aviation Administration to determine how far a laser beam can travel before it falls below the irradiance limits in a Sensitive, Critical or Laser Free zone. Beyond the SZED, the laser light is not expected to cause temporary flash blindness or an afterimage. Beyond the CZED, the laser light is not expected to cause significant or blinding glare. Even if the light is bright, it will be possible to see objects past the light. Beyond the LFZED, the laser light is not expected to be distracting. It will not be brighter than other city or airport lights seen outside the cockpit window. 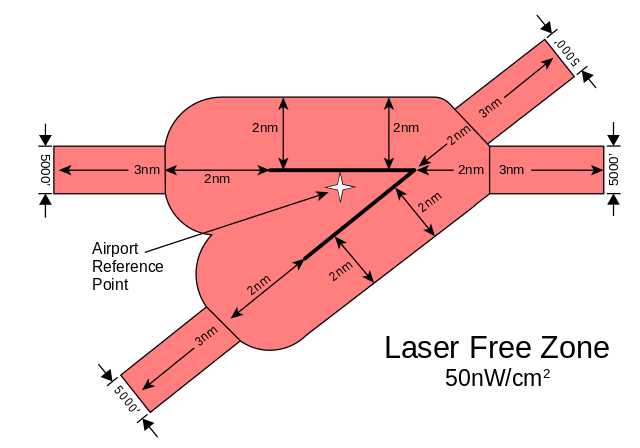 The U.S. FAA Laser Free Zone extends horizontally 2 NM (3,700 m) from the centerline of all runways (two dark lines in this diagram) with additional 3 NM (5,560 m) extensions at each end of a runway. Vertically, the LFZ extends to 2,000 feet (610 m) above ground level. 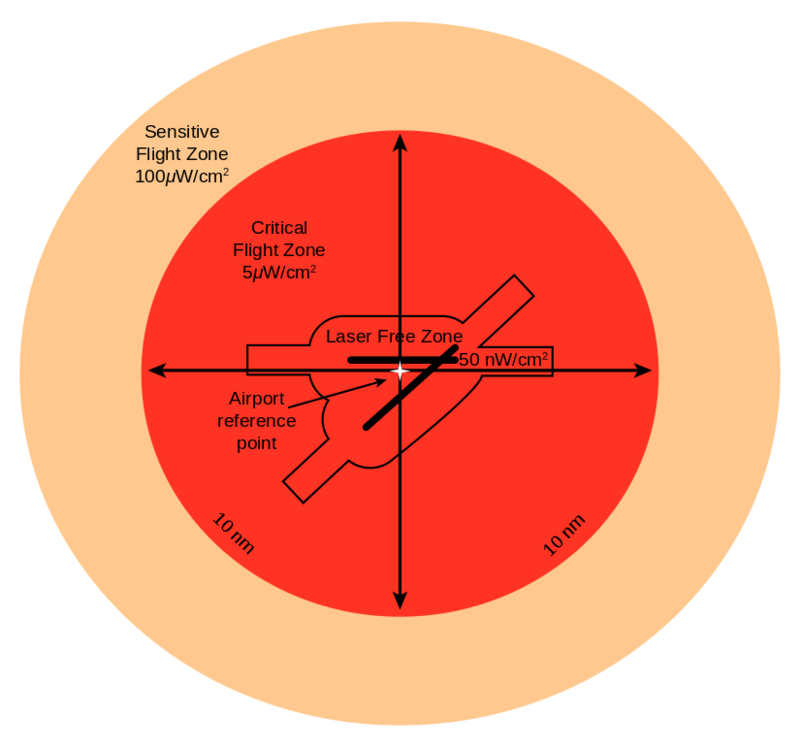 The U.S. FAA Critical Flight Zone extends horizontally 10 nmi (19 km) around the airport, and extends vertically to 10,000 feet (3,000 m) above ground level. The optional Sensitive Flight Zone is designated around special airspace needing bright-light protection. CAUTION: If any of the visual interference distances — SZED, CZED or LFZED — are less than the NOHD, then use the NOHD instead. This is to avoid cases such as a blue or red beam which appears so dim to the eye that it has a short visual interference distance, but can still be an eye hazard to a greater distance. The goal is to not allow a person to be exposed at a distance shorter than the NOHD. Take for example a deep blue 445 nm laser. Enter the VCF of 0.0305 in the calculator. The SZED will be less than the NOHD, no matter what the power or divergence. If you were filling out the FAA Advisory Circular 70-1 “Laser Configuration Worksheet,” you would be required to enter “Less than NOHD” in the SZED space. The three visual interference distances SZED, CZED and LFZED are submitted to FAA using Advisory Circular 70-1. This is because FAA wants to know how far from the laser that flashblindness, glare and distraction can occur. However, for persons with laser pointers and those doing laser light shows, these distances are academic. This is because FAA requires these users to simply not hit aircraft. It does not matter if you can show that your laser was beyond the Laser Free Zone Exposure Distance, and thus was not a distraction to the pilot. For laser light show producers, FAA will object to a show that illuminates an aircraft. You will be required to use spotters or other techniques to detect aircraft and shut off the beam if it would go towards an aircraft. Note that since all three lasers have the same power and divergence, the NOHD for these would be equal. It is only the visual interference distances that will change based on the wavelength. To calculate beam diameter and irradiance at a specified distance, use the calculator here. For a full-featured hazard distance calculator, with the NOHD, ED50, and FAA visual interference distances, click here. We also have information about other calculators and dedicated programs. These can analyze complex situations involving multiple simultaneous colors, pulsed lasers, non-visible lasers, and/or atmospheric attenuation. If you are a member of the International Laser Display Association, you can use ILDA’s free online Skyzan professional laser hazard calculator.